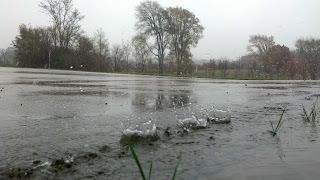 Under the Oak Tree: More rain! At Arington Tree Farm we save many of our indoor projects for the winter months or for rainy days. Needless to say with the drought of 2012, rain days have been scarce. However, the last few weeks have given me plenty of chances to work in the shop. The photo above was taken looking out of the shop door.